Swansea manager Garry Monk has avoided any further action from the FA after accusing Stoke winger Victor Moses of cheating, according to his club. Monk said Moses had dived and should be ashamed of himself after he was awarded a penalty during Stoke's 2-1 win at the Britannia Stadium. He also called referee Michael Oliver's decision to give the spot-kick during the game on 19 October "disgusting". Monk was asked by the FA to explain his comments but has avoided punishment. Swansea confirmed no disciplinary measures were being taken but said Monk had been reminded about his responsibilities regarding media comments. Monk has voiced his frustration at a number of decisions he feels have gone against Swansea this season and sent a list of what he considers to be refereeing mistakes to Mike Riley, general manager of the Professional Game Match Officials Ltd (PGMOL). The Welsh club was involved in another controversial decision on Tuesday as Liverpool scored two late goals to knock them out of the League Cup with a 2-1 win at Anfield. The Swans had defender Federico Fernandez, 25, sent off late on for a challenge on Philippe Coutinho before Dejan Lovren scored five minutes into stoppage time to send Liverpool into the quarter-finals. They have appealed against that decision. Meanwhile, Monk's wife has defended the Swansea manager on Twitter after claiming to have received a letter from a neighbour criticising his management. Lexy Blackwell said that she was "absolutely incensed" at the "audacity" of the letter she said had been hand delivered to the family home. She said the sender should become a manager if they could do better. The incident came the day after Swansea's cup defeat at Liverpool. Former Swans' defender Monk, 35, was handed his first managerial job when he took over at Swansea in February after 10 years playing for the club. 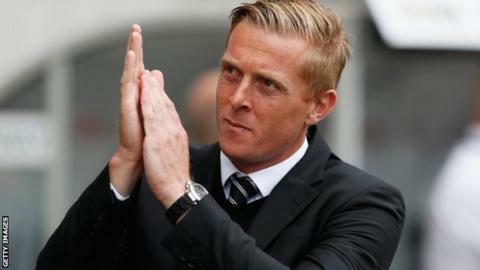 The appointment was then made permanent in May when Monk signed a three-year contract after securing the Swans' top-flight status. He was was named Barclays Premier League manager of the month for August and has guided the team to sixth in the table with 14 points from nine games.